Did you know that your Electronics Contract Manufacturer could be damaging your product, impairing reliability and customer goodwill, and you may not know it? If you choose the wrong Electronics Manufacturer, the best-case is that your organization may lose money, and customer goodwill -- and you could be out of a job. At worst, the wrong CM can put your organization out of business. 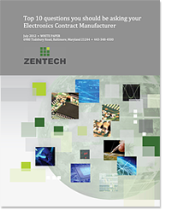 Download our guide the “Top 10 questions you should be asking your Electronics Contract Manufacturer” and learn how to increase the likelihood of success in fulfilling your contract manufacturing requirements.